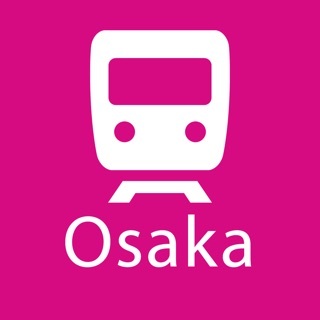 Official travel support App of Saga Prefecture ""DOGANSHITATO?"" is now available! Its various contents and Multilingual Call Center which is open 24/7, will make your trip a memorable one. 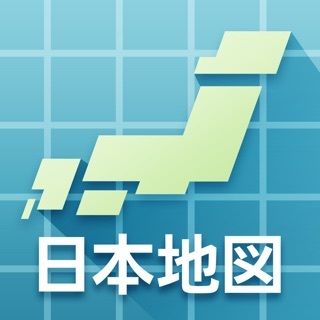 This single App ""DOGANSHITATO?"" will give you all the support you need while traveling around in Saga. The Saga dialect ""DOGANSHITATO?"" means ""What's the matter?"" in English. People in Saga are very considerate of others especially when they see someone getting into trouble. This phrase symbolizes the local people's friendliness. 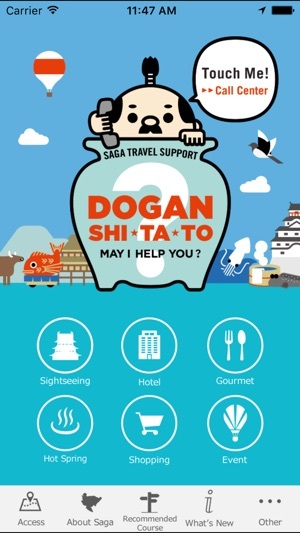 Saga Travel Support App is ready to help you and the other foreigners with the spirit of "DOGANSHITATO?" 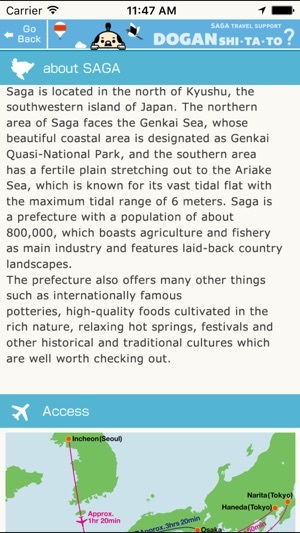 Full of information on tourist spots, hotels, gourmet food, hot springs, and shopping in Saga Prefecture. You can search by your current location or category, and the app will navigate you to your destination via GPS. Multilingual Call Center (English, Chinese, Korean and Thai) which is available 24/7, will provide you with an interpretation service and tourist guidance over the phone or Skype. If you need help speaking to a Japanese staff at a facility, feel free to contact the Multilingual Call Center and request for an interpreter. Search for a free Wi-Fi spot near your current location. Search for foreign exchange spots and ATMs supporting foreign cards near your current location. Limited coupons for App users! You can win a reward by participating in the limited time offer stamp rally. Access information: going to Saga and getting around Saga. The recommended course will navigate you around various spots in Saga using the GPS. Post your comments on Twitter and Facebook using the App. We will keep you posted on events and other recent news. Saga has many hidden treasures and gems that often are missed by foreign tourists. 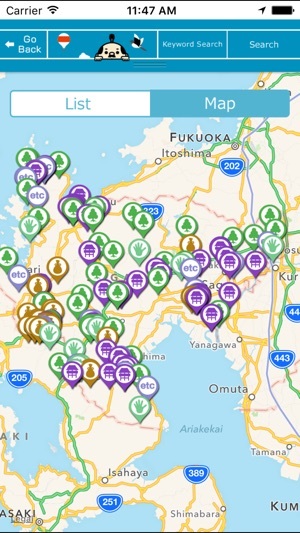 With this app, navigating Saga is much easier. Services include transportation guides, restaurant recommendations, accommodation recommendations, events and their descriptions, and even times to view the various flowers blooming. There is phone support available as well in multiple languages.